Different Dimension - Cosmologically Speaking part 3 - Polish Etc. 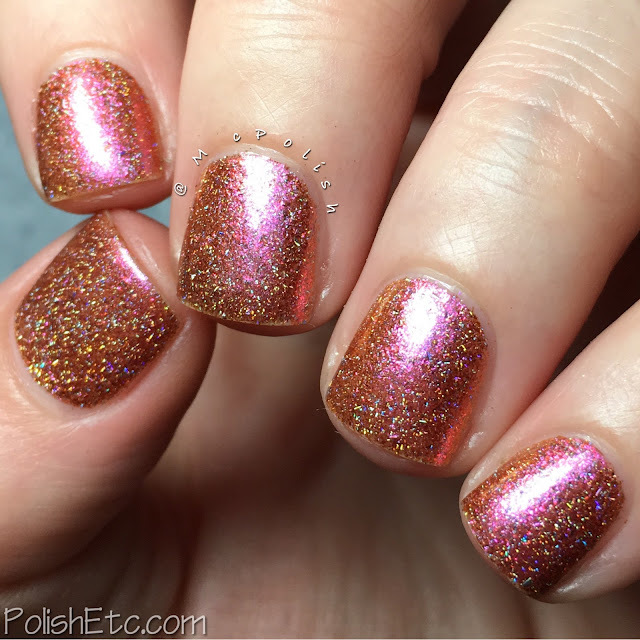 I have some shifty shimmers to share with you today. 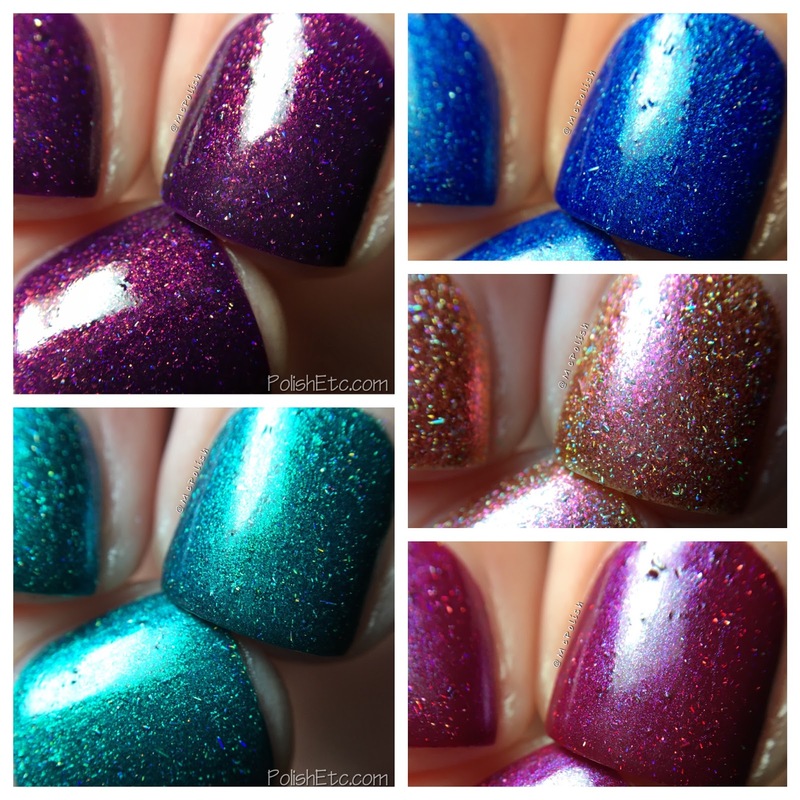 Different Dimensions has just released a little collection of 5 polishes with tons of shimmer and bright saturated colors. I took a ton of photos of these polishes to try and get all the angles. They all have a little bit of a duochrome effect and are filled with holographic sparks. The sparks make these quite gritty in texture so a thick glossy top coat is definitely needed. For all of these swatches, I did a final macro using two light sources to try and show off the shiftiness. This collection released last week, so they are all available now. Let's take a look! Click through for many more photos! 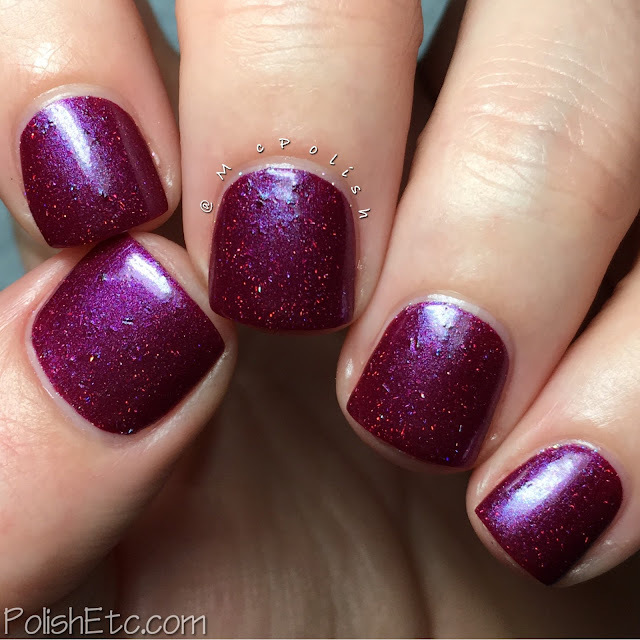 "The Eagle Has Landed" is a deep purple with a shifty coppery shimmer and holographic sparks. I love this color combo of purple and copper and I think it will be a favorite of many. These holo bits (which I have been calling sparks) have been showing up a lot in indie collections lately. They are quite gritty and irregular and tend to poke out a little. A good top coat is recommended. I did two coats of polish topped with IBD Top Coat. 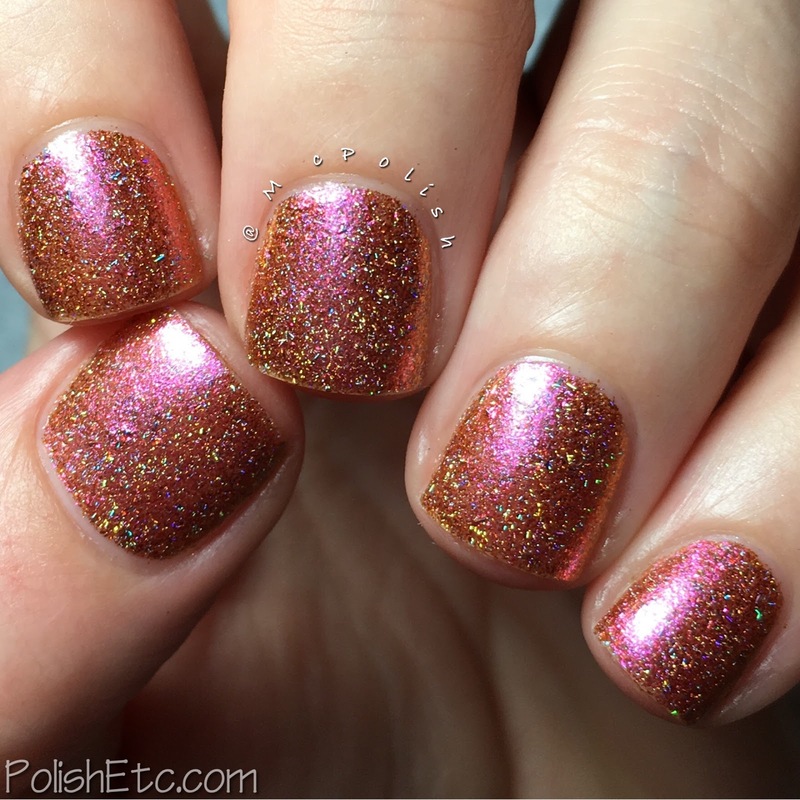 "SpaceX" is a shifty peachy/pink microshimmer with a ton of holographic sparks. This was the most sheer of the bunch. It is mainly a ton of peach microflakies in a clear base that give off a strong pink shift at and angle. The holo really pops in this one. I did two coats topped with IBD Top Coat. 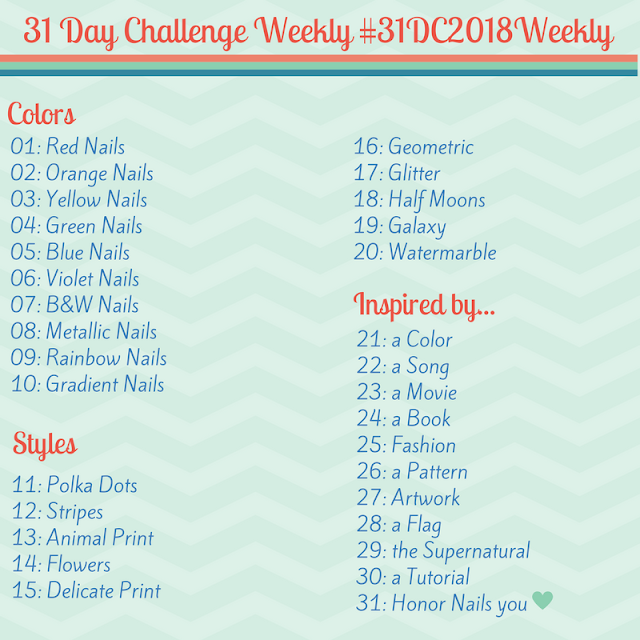 If you have longer nails than me, I might want to do three coats. "Houston, We Have a Problem" is a raspberry/magenta with a bright blue shimmer and holographic sparks. The blue flash is really pretty in this one but the sparks are really prominent. I don't love the sparks as their bumpiness distracts from the beauty of this shade. This is two coats with a glossy top coat. "International Space Station (ISS)" is a deep teal with a lagoon blue shift and holographic sparks. Oh damn! 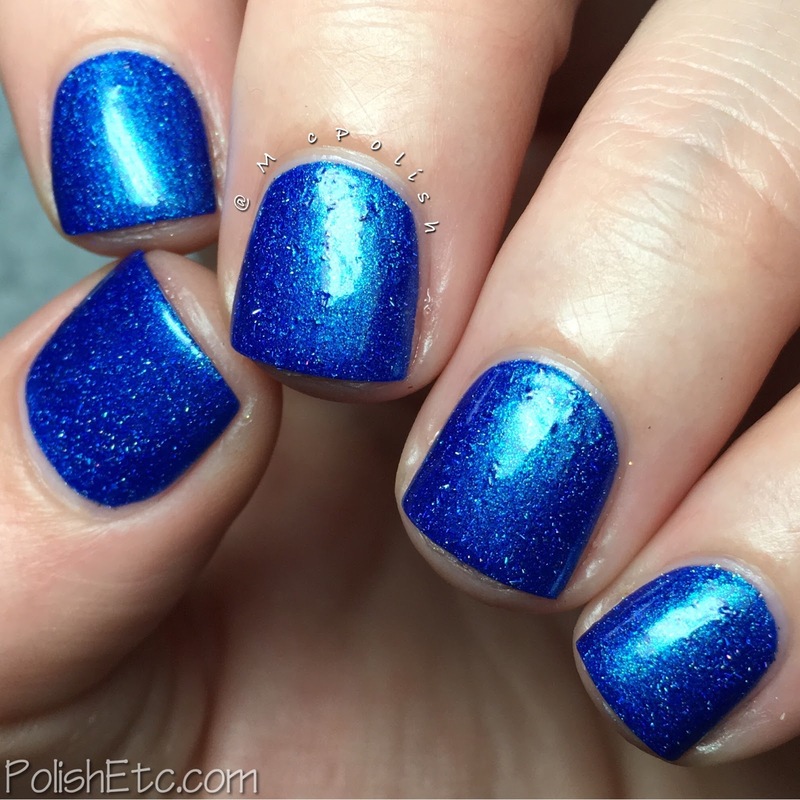 This polish really glows from within. There is so much depth in this polish. The color is both deep and bright. My camera make my skin all zombie like and when I tired to color correct it, it made the polish color off. So zombie fingers it is! I did two coats topped with IBD Top Coat but I really only need one coat. This one is a keeper! "Hubble" is a bright cobalt blue with an aqua shimmer and holographic sparks. This one is pretty bright, as well. Again, the sparks are a little gritty and more prominent in this polish. This was two coats with a glossy top coat. I think The Eagle Has Landed and International Space Station are the winners here. They just have such a nice shimmer and deep color that I enjoy. Now the sparks, I personally don't enjoy them but there are plenty people that do. But I can look past the sparks for colors as beautiful as these. Different Dimension is selling these each for $10 for you can get all 5 for $45. That is a nice price! Head over to the Different Dimension online store to get yours now. Great swatches!! These are stunning! Wow, the Eagle sure is beautiful! But before I buy myself silly - here's a question: how is removal? No issues with removal here. The sparks do not act like glitter and should remove the same as shimmer. Yeah...I wish they weren't as pronounced as they are.